I was excited to read this one as soon as I read the summary. The whole "going through [person important to protagonist]'s list and doing everything on it" trope? I'm all here for it. Unfortunately...I kind of feel like I was misinformed. 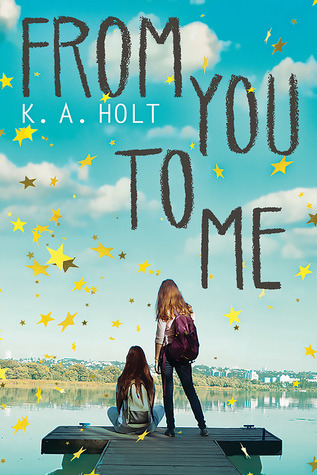 From You to Me was a touching story about a girl living with her grief over her sister's death. The characters were great -- I loved Mrs. Grant and all the fun grilled cheeses. Twitch and his friends were also great. And I also loved that Amelia's dad dealt with his grief by quitting his job and starting a food truck. But this was not a story about Amelia going through and completing Clara's list. The list is mentioned at the beginning, yes, and Amelia does decide (with her best friend Taylor) to complete it. But, without giving too much away, it didn't really feel to me that she was consciously going through the items on the list. It felt like she was just trying to live with her grief and then if something happened it was like, "Oh yeah, the list -- this was on it? Kinda. Sure. Cross it off." Like, I could almost see if the whole list idea was added onto the story later in a round of edits. This was not a bad book by any means. I can see it being a great story for a young girl, or a girl Amelia's age, to read who is dealing with something similar. It is real, and that will make it relatable for its readers. I just wish the summary better reflected the contents so I knew what to expect going in. Thank you to Scholastic for sending me a advance reader's copy of this book in exchange for my honest opinion.